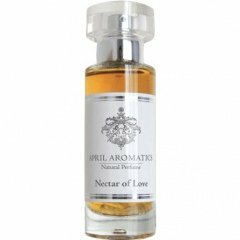 Nectar of Love is a perfume by April Aromatics for women and men. The release year is unknown. The scent is floral-sweet. It is still in production. Nectar of Love is a full-bodied, well-rounded feminine fragrance. The sandalwood is quite prominent in the scent, and at certain moments I am reminded of Samarsa, even though Nectar of Love is a much richer fragrance. The neroli & tuberose also are key to this scent, neither of which I am fond of personally, but I can forgive a scent as lovely as this. Nectar of Love is has a beautiful lushness to it. I'd say it's a floral woody - if there even is that classification - buttressed by thick, almost syrupy (but not sugary) fruits. Must be the nectar in Nectar of Love. Wearing it in summer heat -- as I am today -- is not recommended, as it is almost oppressive & certainly too heavy for this weather. However, Nectar of Love would be glorious on a gray November day, when you want to be reminded of sunnier days, or in late February, when it seems that Spring is just around the corner. Overall, I love the impression & the character of this scent. I just don't love white florals enough to purchase it. But I do like it enough to try other fragrances from April Aromatics. Really a well-made and well-executed fragrance. The scent could be *to*die*for* in scent-saturated body products, like a luscious bar, a thick cream or full-bodied bubble bath. Write the first Review for Nectar of Love!